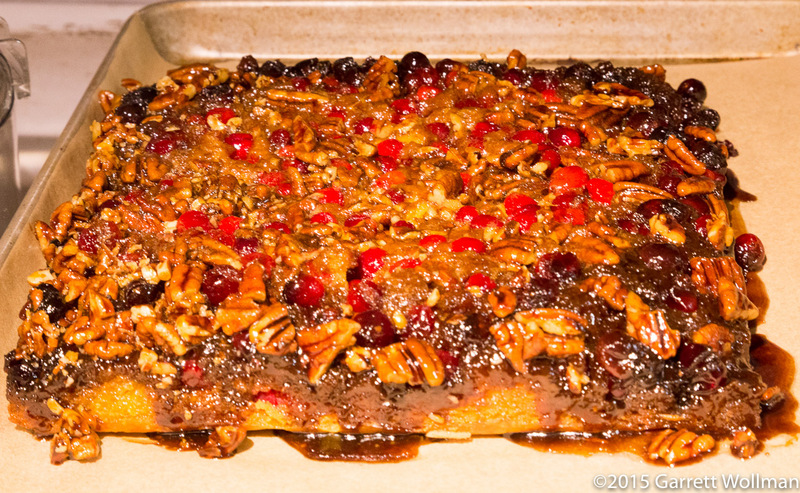 The parts list for this cake is really short and simple: two sticks (225 g) of unsalted butter, 7½ oz (210 g) of brown sugar, 4 oz (110 g) of toasted, chopped pecans, and two cups (approximate measure) of fresh cranberries make up the topping. For the cake, the wet ingredients are 9½ oz (270 g) of pumpkin purée, two large eggs, and 90 ml of vegetable oil; the dry ingredients are 6⅜ oz (180 g) of all-purpose flour, 200 g of granulated sugar, 1½ tsp of baking powder, 1 tsp of cinnamon, and ¼ tsp of salt. 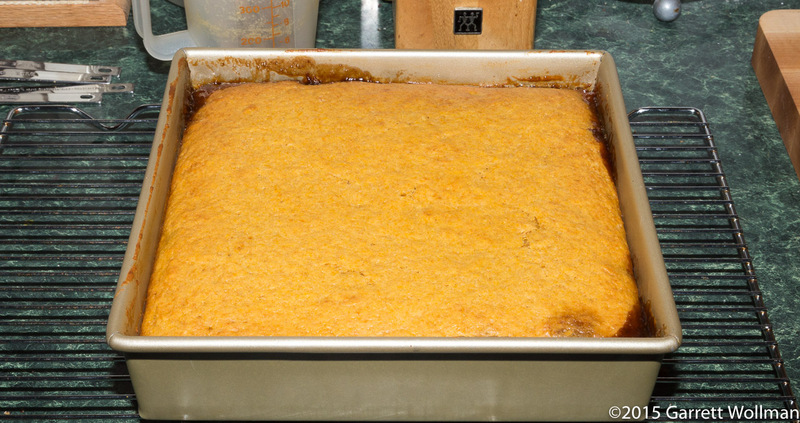 Since this is an upside-down cake, the topping goes into the bottom of a 9×9-inch (23×23 cm) pan before the cake batter is spread on top. 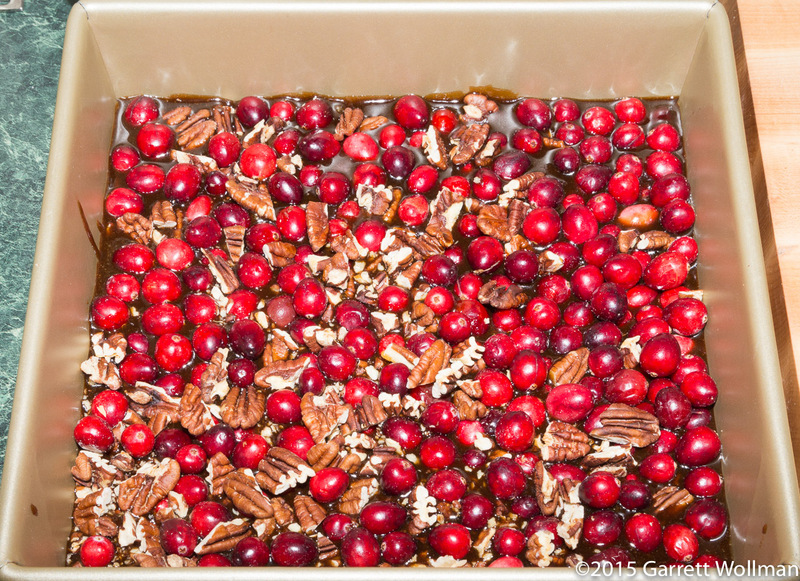 The topping is made with a brown-sugar-butter syrup (just brown sugar — or dark muscovado, which is what I used — whisked into melted butter until fully combined); this syrup is just poured as-is into the pan, and then the cranberries and pecans (having been mixed together) are distributed evenly onto the syrup. There’s no need to actually mix the syrup with the other topping ingredients. 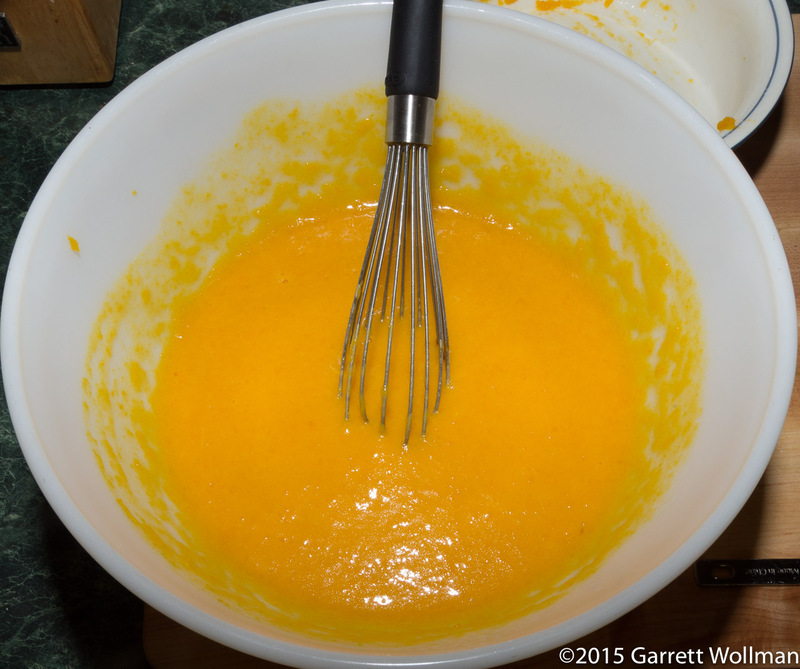 To make the cake batter, we start by whisking all the dry ingredients together, then doing the same with the wet ingredients (shown here — oil, pumpkin, and eggs, but unusually, not sugar). The dry ingredients are carefully mixed into the wet, stopping when there are no visible dry pockets. 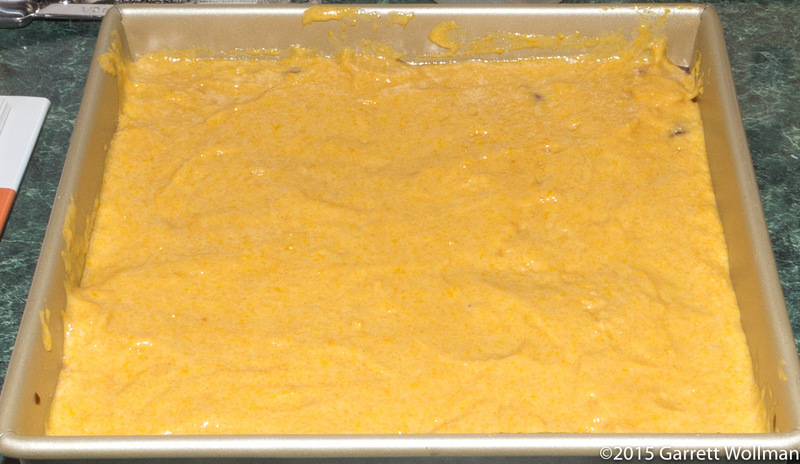 This cake batter is fairly viscous, and must be spread across the topping already in the pan to cover completely. I just used a spatula (and a few judiciously applied fingers) for this. The cake is baked in a 350°F (175°C) oven for 35–40 minutes. I took it out after 35 minutes, because my tester seemed to suggest that it was done, but in retrospect I think it could have used closer to 40 minutes. After cooling on the rack to 10–15 minutes, it’s time to invert — and therein lies a problem: I don’t have any inch diameter platters! The only vessel I had that was large and flat enough to serve this cake was a plain half-sheet pan, which I lined with a sheet of parchment to ease clean-up. Luchetti’s headnote says “Makes 8 to 10 servings”, but that would have been a whopping 700 kcal per serving, so I cut it into 16 pieces (2¼#x2033 squares) instead — and of course several of my tasters decided that those fairly small pieces were too big and cut them into even smaller bits. (Seriously, if you don’t actually want any, please just say “no thanks”!) And yes, the white balance is a little screwy in this photo. 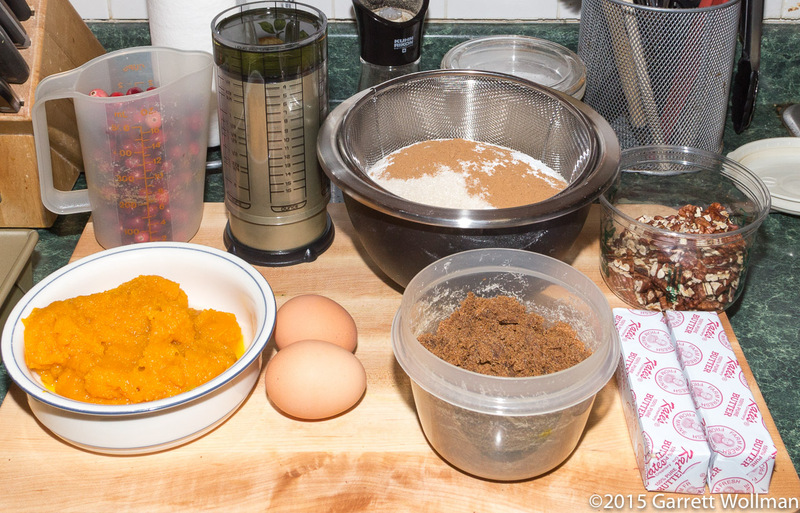 This entry was posted in Food and tagged cake, Emily Luchetti, pumpkin, recipe. Bookmark the permalink.